BayLibre is an embedded software engineering firm. We specialize in embedded Linux, custom firmware, SoC support and product development. Only heavily changed 3.10/3.14 kernel for Android is available. BayLibre develops and maintains the AmLogic kernel upstream, along with community contributions. I recently been added to the experimental drm-misc write group where I can push Acked patches for small changes in drivers directly in the git repository. System Control and Power Interface is the protocol implementation between the ARM Cortex cores and the "System Control Processor" useally implemented using a Cortex-M3 core in an Always-On power domain. Having stable Firmware protocols seems a good idea, but in this case Amlogic based it's SCPI firmware implementation on an early Juno released to Cortex-A53 licensees. 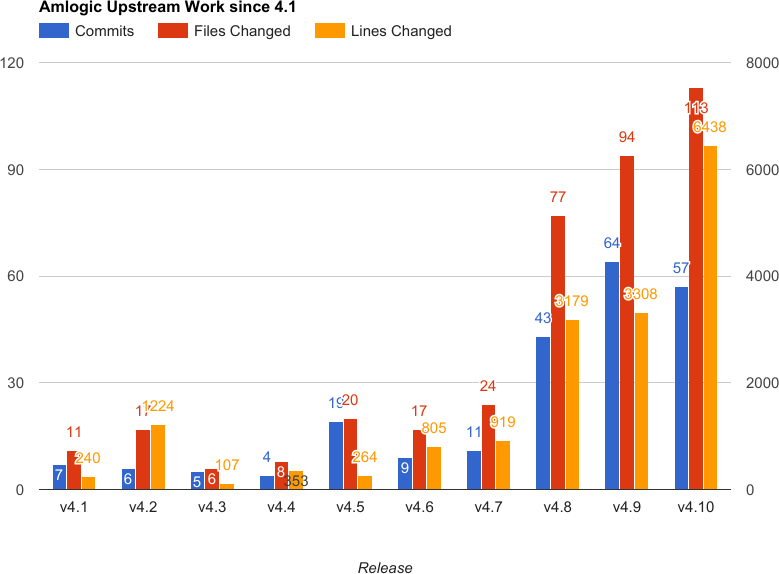 But ARM reworked and pushed an updated version of the SCPI protocols upstream. Hopefully (sic), Rockchip used the same SCPI version for their SCPI implementation. All communications to the SCP firmware are required to use a Mailbox to synchronize. Thanks Jassi Brar for your support ! SCPI now supports GXBB on Linux 4.10. Kevin Hilman wrote a brand new MMC host driver from Amlogic's implementation and the provided public Datasheet. In the end of 2016 Amlogic published the code for their GXL ang GXM family variants. 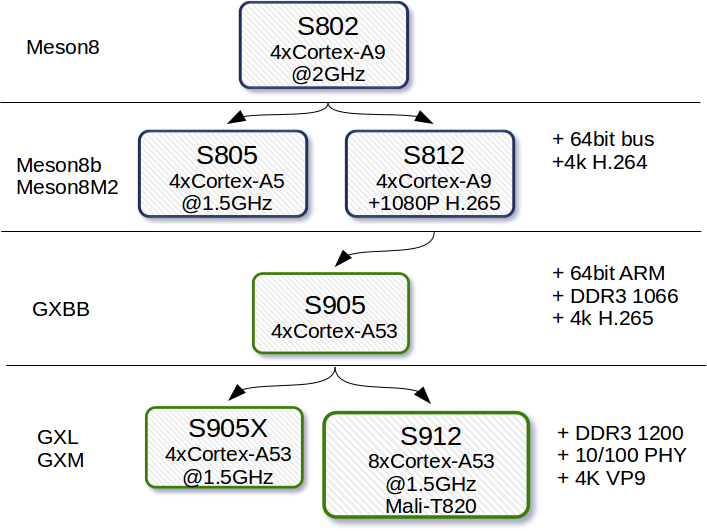 These SoCs are enhanced version of the S905 with support for 4k VP9 and H.265 decoding. 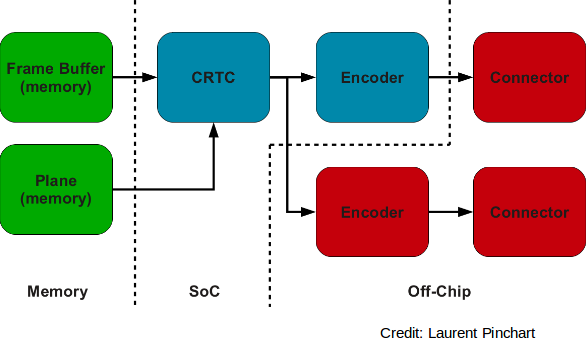 Amlogic SoCs has a complex and feature-full Video Display pipeline that can easily match the Linux DRM structure. The new GXL and GXM SoCs features an embedded RMII 10/100 Ethernet PHY muxed with the external RGMII 10/100/1000 interface. Last round of optimization make possible to achieve 140Mbytes/s on eMMC. 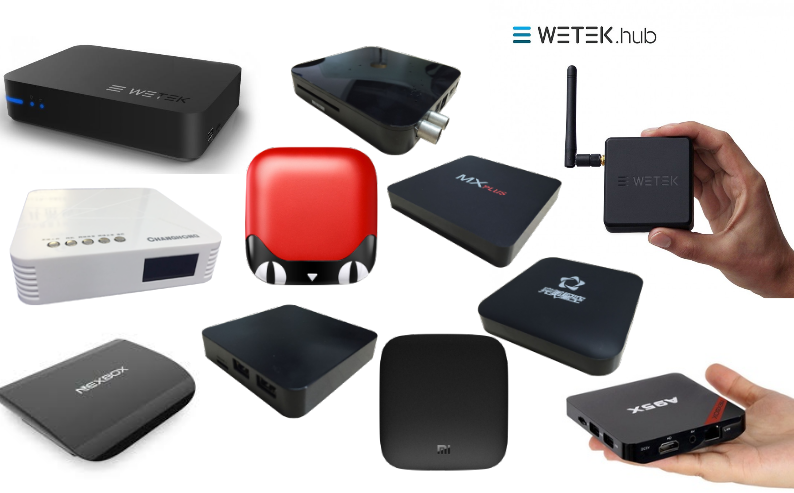 Heiner Kallweit, an hobbyist is currently pushing support for these features. GXBB embeds a Mali-450 MP3 IP that renders OpenGL ES 1 & ES 2. ARM provides a GPL kernel driver that discusses with the user-space OpenGL shared library. Still need some work on GXM to support the Mali-T820. User-Space library must be generate by the SoC vendor and must match the hardware config and kernel driver version. The Amlogic SoCs uses a Synopsys DesignWare HDMI Controller like multiple other SoCs. Hopefully, a clean dw-hdmi bridge driver has been pushed a while ago. Add overlay planes with support for YUV 4:4:4, 4:2:2, 4:1:1, YUYV, NV12 or NV21. The SoC provide S/PDIF, I2S, PCM input and output. Basic I2S output has been written and works throught HDMI or external DAC. 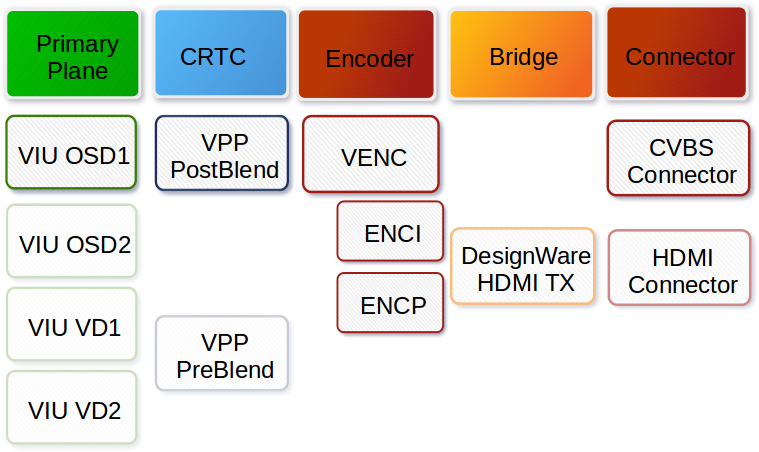 One of the best features of those Amlogic SoCs is the Hardware Video Decoding and Encoding. This will be handled as V4L2 driver to support full control from user-space application. With support of Overlay planes in the DRM Display Driver, such decoded video frames could be played from graphical applications like VLC. 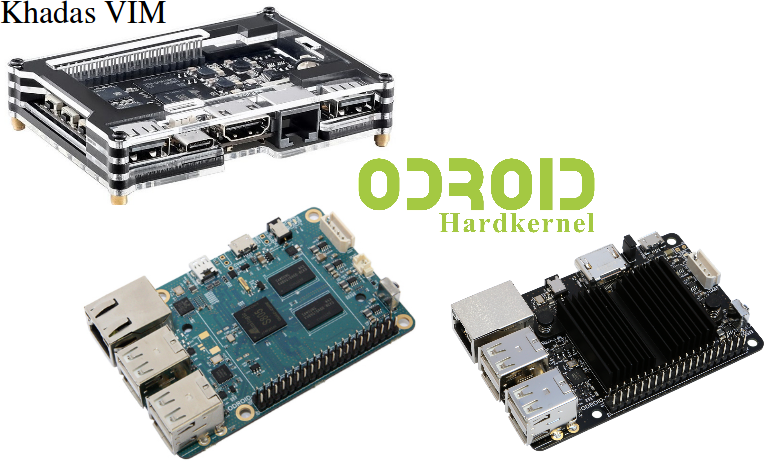 A lot of people loves to hack the Odroid-C2 board, and great applications like OpenELEC, LibreELEC of KODI runs on these platforms. A big part of Raspberry Pi projects are modified to run on the S905 platform, thanks to it's more powefull Mali-450 GPU and 4K Video Output and Video Decoding capability. A few independent hacker pushes regurlary patchs to fix and support more features on the Amlogic SoCs. Such work keeps us focus on bigger features and we provide the community tests and integration to kernelci for automated boot testing.